Hydreigon in game: 1,211 Who? Important notice! Pokemon Hydreigon is a fictional character of humans. Hydreigon (Japanese: ????? Sazandora) is a dual-type Dark/Dragon pseudo-legendary Pokémon introduced in Generation V.
It evolves from Zweilous starting at level 64. It is the final form of Deino. 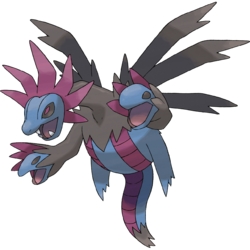 Hydreigon is a three-headed, draconic Pokémon with six thin, black wings that each end in two points on its back. It has a fuchsia-colored collar on its neck which surrounds its head. The main head is dark blue and has black eyes with fuchsia pupils. Its two hands are also black and each one harbors a head; these are similarly blue with black eyes with small fuchsia collars on the inside. Its abdomen has two fuchsia stripes and its feet appear atrophied, having no claws or defined soles and two or three small toes. Its tail also sports a fuchsia stripe and ends with a black tuft. Hydreigon is a violent, destructive Pokémon. It will attack anything that moves, determining it a foe. Its heads can consume anything. A Hydreigon under the ownership of Carlita appeared in White—Victini and Zekrom and Black—Victini and Reshiram. However, it is Shiny in the former. Hydreigon made its TV debut in Iris and the Rogue Dragonite!. It was seen battling Iris's Dragonite and injured it in the process. Another Hydreigon appeared in A Village Homecoming! with Shannon, evolving from a Zweilous. A Hydreigon under the ownership of Cameron appeared in Strong Strategy Steals the Show! and Cameron's Secret Weapon!. A Trainer's Hydreigon appeared in A Relay in the Sky! competing in the Pokémon Sky Relay. A Trainer's Hydreigon appeared in Valuable Experience for All!, where it was seen being defeated by Remo's MegaGarchomp in the Lumiose Conference. BW100 Hydreigon Ash's Pokédex Hydreigon, the Brutal Pokémon and the evolved form of Zweilous. Hydreigon uses its six wings to travel the skies. It will attack anything that moves, seeing it as an opponent. BW107 Hydreigon Ash's Pokédex Hydreigon, the Brutal Pokémon and the evolved form of Zweilous. 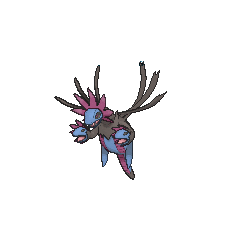 Hydreigon believes that anything that moves is its opponent, viciously attacking with its three heads. Muteki used a Hydreigon in a Double Battle against Monta. Hydreigon appeared in White—Victini and Zekrom under the ownership of Carlita. A Hydreigon debuted in LDK1. Ghetsis used his Hydreigon to fly to Dragonspiral Tower to meet N. It was later used in a battle against Black. Hydreigon appears in the background of the Kalos Pokémon League stage when the stage is in the Dragonmark Chamber. It appears alongside Dragonite, Garchomp, and Axew. NA: Unlike Scizor with its pretend heads, Hydreigon's three heads are real! The center head is the brains of the operation, while the left and right ones are there to consume everything they can. We wouldn't be surprised to see Hydreigon at an eating contest, but there has to be a rule against having three mouths on one body...? Pokémon Mystery Dungeon: Gates to Infinity: Hydreigon was at first described by Munna as an evil Pokémon who is pure destruction in Pokémon form, devours everything in his path, and said to be the cause of the world's balance being disrupted. In truth, Munna's words about him were all a lie to trick the player, and Hydreigon is really the physical embodiment of the Voice of Life, the form of the world's will to live, who called upon humans to save the Pokémon world as no Pokémon could hope to save it. He originally first contacted the player through a dream before Munna intercepted the vision, and by using Hydreigon's voice, she tricked the player into thinking Hydreigon was evil. Moves marked with a superscript game abbreviation can only be bred onto Hydreigon in that game. 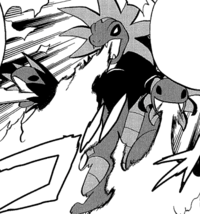 He and Haxorus had accepted Gothitelle's to be strong. Since they lost against you, he doesn't mind working hard anymore. 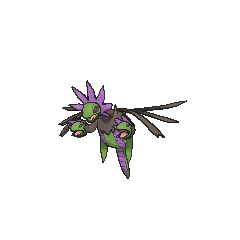 For other sprites and images, please see Hydreigon images on the Bulbagarden Archives. Hydreigon is based on the Yamata no Orochi, including its red eyes. Its three heads and Shiny coloration resemble the Zmey Gorynych. It may also incorporate elements of the Lernaean Hydra. These mythological serpents may have inspired Hydreigon's Dark typing, as all three are deadly antagonists, with the Zmey Gorynych in particular shown to be deceptive. According to interviews with Ken Sugimori in Nintendo Dream, Hydreigon and its evolutionary family were originally intended to be cyborg dragons with aspects of tanks. The Pokémon were scrapped until late in development, when they were revived and remade to be based on Yamata no Orochi. 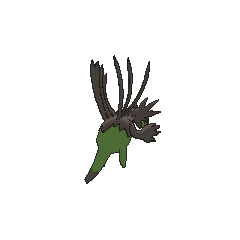 The tank tread-like markings on Hydreigon's body are a remnant of this design. 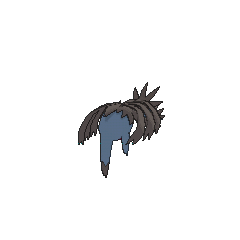 Although Yamata no Orochi typically has eight heads in mythology, Hydreigon was designed with fewer heads to appear less confusing. 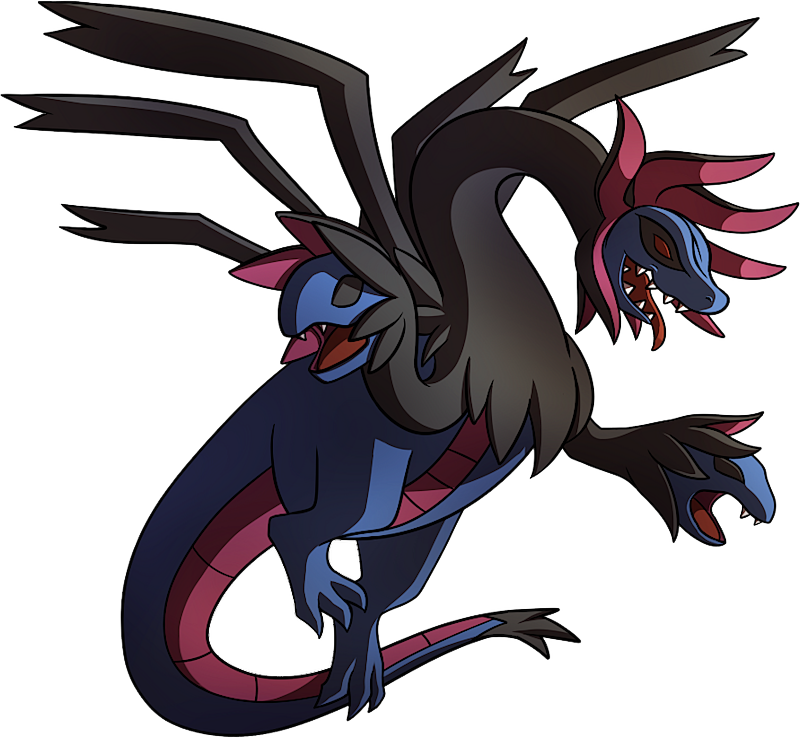 Hydreigon may be a combination of hydra, drei (German for three), and dragon. Sazandora may be a combination of ? san (three) and dragon or hydra. Mandarin Chinese ??? / ??? Santóulóng Literally "Three-headed dragon"